From the Robotics Community on Facebook... this is amazing. Do you know how many times I have received emails that say pretty much exactly that ? 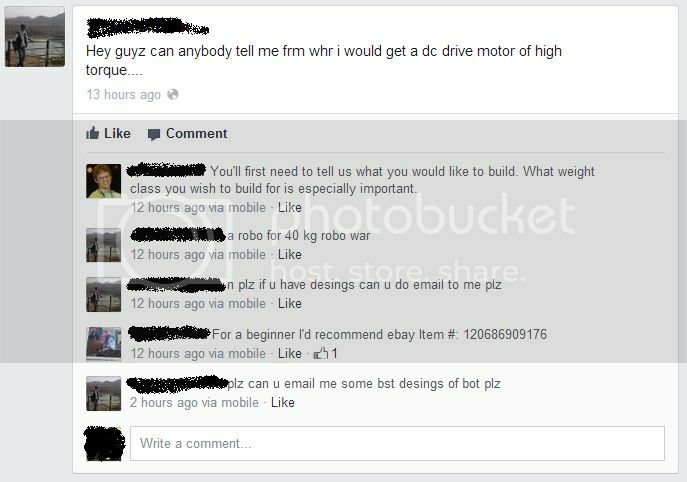 "I am an highly experienced, proven winning, qualified Robot Engineer - check my history - So to make sure you are approaching this sport with the right mindset, Please tell me how much money you are planning to spend on your Robot, and send me 10% of that upfront as a skilled design consultants fee... *then* I will send you quality design information appropriate to your chosen budget.. If this doesnt sound like a good idea to you, then go and ask the kids in the toystore, Im sure they will have some great tips for your 'leet Hax0rs Indestrutible Killer Bot.. Good Day"
I was going to post this in a safety thread but since it relates to the previous posts I will put it here. I listen to podcasts while driving around for work and because I fly RC helicopters I listen to the RC Today Show. For the last few weeks one of the regular hosts has been off after injuring himself while testing the head speed of one of his helis. This week he is back and explains what happened in full detail. I suggest that people here have a listen to the first 10 minutes of episode 92 and think about what may happen if you are testing a robot alone and something bad happens. although only short for some reason (and with boring talking), if you want to know how to dispose of a large body (35m long, 30m wing span) military aircraft (can't just do the F-111 and dig a big hole) Defence recently feed three to what looks like a very fun tool to use.